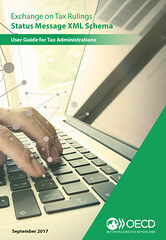 This publication contains the OECD's standardised IT-format for providing structured feedback on exchanges on tax rulings (ETR) pursuant to BEPS Action 5 – the ETR Status Message XML Schema – as well as the related User Guide. From an IT perspective, jurisdictions will in most instances rely on the ETR XML Schema, developed by the OECD as part of BEPS Action 5, for exchanging information on tax rulings. The ETR Status Message XML Schema allows Competent Authorities that have received information on tax rulings through the ETR XML Schema to report back to the sending Competent Authority, whether the file received contained any file and/or correction-related record errors.